File resolution - also known as DPI (Dots Per Inch) or PPI (Pixels Per Inch) - refers to the number of dots or pixels in an image. Generally, the more dots per inch, the more detail captured and the sharper the actual image. As such, it's important to start out with an image that has a resolution of at least 300 dpi. You may have to contact the original designer of your image to get a higher resolution file, or you can decrease the print size of your image. Our editing tools will notify you if it detects that your image resolution is too low, and recommend the maximum size your image should be in order for it to print properly. 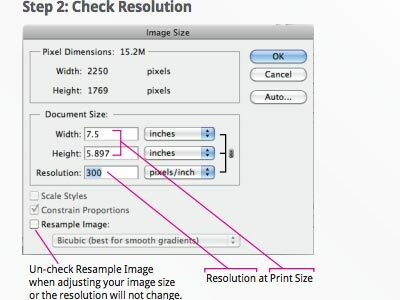 Download the attached PDF guide for checking the resolution for your JPG/PNG/GIF image upload using Adobe Photoshop.